Lighten Up! : The Authentic Way to Lose Your Weight and Your Worries is written by Loretta LaRoche, an internationally known stress coach, former aerobics instructor, and wellness consultant. Loretta LaRoche takes a humorous approach to dieting as she introduces readers to her eight secrets for losing weight. She promises that you can release excess pounds and get in shape while having fun in the process. LaRoche says that we have forgotten how to have a positive relationship with food and to enjoy eating. We need to realize that food is neither the enemy nor the savior and to learn how to create a balanced attitude in regards to our diet. Instead she encourages you to focus on the things you love about the foods you eat each day and what it is about them that give you the most pleasure. Dieters are recommended to keep a food journal of these experiences and observations. For example, “I met Josephine for breakfast at the diner and ordered pancakes, which were probably a little too extravagant, but they were so light and fluffy that they were worth it. Still I ate only about half of what was on my plate. She recommends following a French style of eating with three meals a day, small portion sizes and a little wine. She also encourages family meals because research shows that this can help us to live longer, healthier lives. Loretta LaRoche doesn’t provide dieters with a meal plan or even specific dietary recommendations in Lighten Up apart from the advice to use common sense and learn emotional self-regulation. Development of a positive self-esteem is highlighted and dieters are advised to focus on their strengths and create a social support network. Fruit, vegetables, cous cous, quinoa, wild rice, fresh-baked bread, pasta, rice, pistachios, pecans, shrimp, lean beef, turkey, fresh herbs, spices, chocolate, olive oil, wine. Loretta LaRoche says that while exercise is good for you we are under the false impression that we can easily burn off excess calories by working out when we eat too much. This is not really true because it takes a large amount of physical activity to have a significant impact. She says in Lighten Up that when you exercise you should choose something you enjoy and it should never be an obligation or stress. She also mentions that you can even burn up to 40 calories simply by laughing for ten minutes. If you are really committed you should get a fitness assessment from a qualified and certified fitness professional who can offer you personal guidance. Lighten Up! : The Authentic and Fun Way to Lose Your Weight and Your Worries retails at $12.95. Encourages a positive attitude about losing weight. Emphasizes the importance of having a healthy relationship with food. Keeping a food journal can enhance awareness of eating behaviors. Addresses the importance of stress management. Encourages dieters to take responsibility for lifestyle decisions. Lighten Up is a humorous and fun approach to dieting. Does not provide detailed dietary recommendations. Many dieters will require more guidance regarding how to make healthy choices. Some dieters may not relate to Loretta LaRoche’s approach. 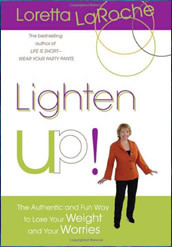 Lighten Up by Loretta LaRoche is a humorous approach to dieting that emphasizes common sense and encourages readers to take responsibility for their food and lifestyle choices. Lighten Up does not include a diet or weight loss program as such but instead advocates a balanced approach that emphasizes enjoyment and fun in relation to dieting, exercise and all of the aspects of life.